Tartar removal for dogs is hard to do, short of having your dog’s teeth cleaned at your veterinarian’s office. It is no different from the tartar that we as human beings get on our teeth that we have to have removed at the dentist office. Dental treats can help remove plaque from your dog’s teeth. 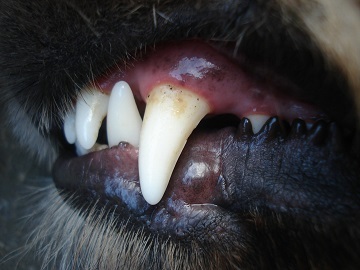 The good news is that dogs don’t get cavities like human beings do, but having tartar buildup on their teeth can be very serious that leads to other medical issues. Having your dog’s teeth cleaned by a veterinarian can cost you around $400 to $500, that is if they don’t run into any problems along the way. Your dog will have to spend at least half a day at the vet office and they will use anesthesia on your dog. It is best to prevent tartar buildup so you can skip the teeth cleaning, and save some money. There are several things that you can do to help prevent tartar buildup on your dog’s teeth and several of them are very easy to do. The best maintenance plan is to prevent your dog from getting tartar on his teeth. Your dog will get plaque on his teeth when saliva, food particles and bacteria come together. If you don’t remove the plaque on their teeth, this plaque combines with minerals in their mouth to become a hard tartar. It is a food residue that can lead to plaque buildup over time. Tartar and plaque buildup can eventually lead to decay and gum disease. Plaque and tartar usually collects along the gum line. The plaque carries bacteria that can damage tooth enamel, and if the plaque stays on your dog’s teeth, that is when it will harden into tartar. So really, it all starts with us wanting to prevent plaque on our dog’s teeth, so they never get tartar, which is much harder to remove. If you can prevent plaque from sitting on your dog’s teeth, you will prevent your dog from getting tartar. There are several things you can do to keep plaque from forming on your dog’s teeth. Brush your dog’s teeth daily or at least weekly. Dog dental treats and toys. Carrots, apple slices and pumpkin. I realize that many dog’s don’t like having their teeth brushed, but this is the best way to prevent your dog from getting tartar on their teeth. If you have a young dog, start right away. It will be easier to get in a routine with them, and usually they are more accepting to something new. I suggest starting slow, and maybe the first time you only brush one side of their mouth and gradually keep increasing how long you brush their teeth. If you are unfamiliar with how to brush your dog’s teeth, take a look at 8 easy steps to clean a dog’s teeth. I suggest using a soft toothbrush and only use toothpaste that is designed for dog’s. Human toothpaste is not good for our dogs. Be sure to brush along the gum line where plaque and tartar usually collect. This will help keep their teeth and gums healthy. There is also an ultrasound toothbrush that is specially designed for keeping your dog’s teeth clean. It can do a much better job than you can with a regular toothbrush, getting all the hard to reach areas, takes less time and is quite to prevent making your dog nervous. It is the Mira Pet Ultrasound Toothbrush. You can read the full review of the Mira Pet Toothbrush here. This might something you want to give a try if you struggle with brushing your dog’s teeth and you are looking for a product that does a better job than regular brushing. Giving your dog a dog dental treat or toy is a great way to prevent plaque that leads to tartar buildup. The best time to give them the treat or toy is shortly after they have finished eating their meals. These treats and toys are designed with ridges or bristles that will help remove leftover food from your dog’s teeth, preventing plaque from building up on their teeth. I recommend Petzlife Complete Treats. These are veterinarian formulated and low in calories. They are nutrient rich with only natural ingredients. Petzlife Treats are free of wheat, soy and corn, which is especially good for any dogs that have food intolerances. They contain dietary fiber, so they are easy to digest and save to give to your dog daily. They are available in 2 sizes, small/medium and large. The ridges on the treat are what help remove plaque from your dog’s teeth. Dental Toys are also a great way to help prevent plaque from sitting on your dog’s teeth. There is a wide variety available to choose from. Not all dogs are overly thrilled with these types of toys, but if you do have a dog that is happy chewing on a Nylabone or other rubber type bones and toys this might be a good option for you. Make sure that it is made of non-toxic rubber and that is has bristles, knobs or ridges that will help clean food from their teeth. You might be able to get your dog more interested in the toy of you choose one that is flavored. Personally, all of my dogs have been bored with this type of toy, but if your dog isn’t bored with them, they do work. Since there is such a wide variety available, and dogs are a bit choosy, it is hard for me to recommend one that your dog will be interested in. This link will take you to Amazon directly to the dental toys if you want to take a look around and find a style you think your dog would enjoy and use. 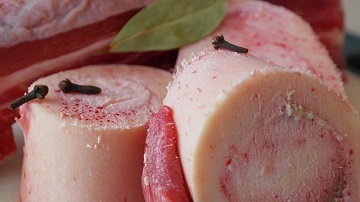 Beef bones like these will help remove soft plaque from dog teeth. You can find beef bones that are raw either at your grocery store or at a butcher shop. These are the big round bones that will have a hole in the middle. They are safe for your dog, your dog will love them, and chewing on these bones will help scrape off soft plaque deposits. You might want to have them chew on them outside or on a blanket. At times, they can get a bit messy. There are several water additives that work well for freshening your dog’s breath and reducing plaque that leads to tartar. 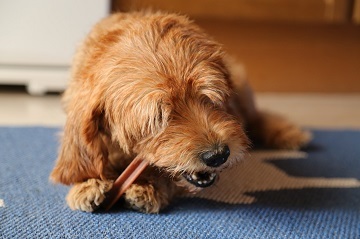 I recommend Nylabone Advanced Oral Care. You simply add 1 tablespoon of the liquid tartar remover with 32 ounces of water. It will freshen your dog’s breath and reduces plaque and tartar buildup. It is formulated with Denta-C, a blend of ingredients scientifically proven to reduce plaque that harbors bacteria. This is an easy method to add into your dog’s teeth care. 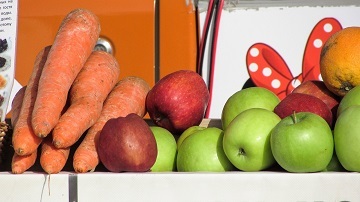 Carrots and apples help scrape food from teeth. All of these are healthy treats for your dog, and while they won’t make established tartar disappear, they will scrape food off their teeth. This will help prevent plaque from hardening and turning into tartar. Using an oral gel on your dog’s teeth is a simple way to help prevent plaque that leads to tartar and helps keep your dog’s breath fresh. You simply apply 2 drops of gel to each side of your dog’s mouth once daily. Your dog licking around in their mouth will help move the gel around to provide complete coverage. It is said that this can be an alternative to brushing your dog’s teeth. I do feel that you should still brush your dog’s teeth, but if the only thing you can get done is using the gel, it is still better than no special care for their teeth. Take a look at Tropiclean Fresh Breath Plaque Remover Pet Clean Teeth Gel. Short of your dog getting his teeth cleaned by your veterinarian, it is pretty hard for tartar removal for dogs. The best plan of action is to keep your dog’s teeth clean so they don’t actually get tartar. It is easy to remove plaque from your dog’s teeth, which means that if you keep the plaque removed, you won’t have to have the tartar removed. Brushing your dog’s teeth is the best way to prevent your dog from getting tartar, but there are several other ideas that I have provided that can help remove plaque, eliminating it turning into tartar. You just need to choose the method that will work best for you and your dog.